​Mrs. Curtis Fry, born Lavina Armstrong, had strong memories from childhood about blocking the South Fork of the Solomon River. The Armstrongs farmed just below the eventual site of the Webster Dam. ​As a child, Lavina and her sister would drive the family’s cattle to the South fork, taking shovels to dig holes in the sand, creating little pools for the cattle to drink from the next day. On one of these trips, it occurred to Lavina, why doesn’t someone dam up the entire stream? Lavina continued to ask that question! February, 1934, she sent letters to Governor Alfred Landon and then to George S. Knapp, chief engineer of the Kansas Water Resources Division. Interest grew after long drought, then the flood of 1938—twin crusades of irrigation and flood control—locals petitioned U.S. congress, State of Kansas, and U.S. Army Corps of Engineers, supporting construction of a dam. The proposed dam on South Fork was part of 1944 Pick-Sloan Missouri River Basin Plan, but there was no action until devastating floods of 1951, and need for flood control became apparent! The Appropriation Act passed Congress in July 1951. One local circumstance held up construction at Webster: the town itself. The town of Webster was scheduled for underwater burial by the spring 1953. Earth moving work on the dam’s foundation began March 14, 1953, but the Bureau granted a sixty day extension the following day for locals to relinquish possession of their property in order to allow Webster’s children to complete the school year in the community school house. 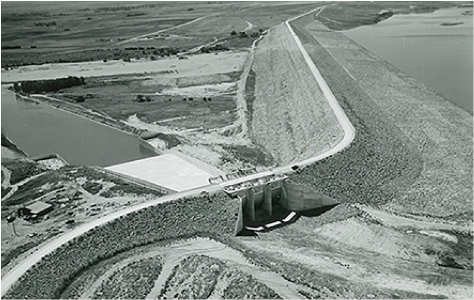 The finished Webster Dam is a modified homogeneous earth-fill embankment stretching for two miles, from above resembling a bending, linear strip breaking the flatness of the Kansas plains. An asphalt highway crosses the top of the dam. Disturbing the structure’s topographic symmetry is the spillway on the left abutment. The outlet releases water into the South fork for downstream use and for diversion into the Osborne Canal at Woodston Diversion Dam for irrigation. The total capacity of the Webster Reservoir is 260,740 acre-feet, of which 183,370 acre-feet is meant for flood control, and 72,070 is slated for irrigation. For most of its history, the reservoir has never been filled. Periods of drought, and changes in farming practices in the upstream watershed often kept the reservoir at very low level. Irrigation was sporadic. Economically, this unit did not provide any monumental fiscal benefits to the towns of Rooks and Osborne Counties. But as a barrier to hold the sometimes cloudburst of the region, Webster fulfilled one of its main objectives, flood control. Based on excerpts from: The Webster Unit: A Webster Lake History, by Robert Autobee, Bureau of Reclamation, 1995. ​October 17. Sand Creek... in Jute it was so high as to submerge houses or dug-outs of settlers, water rose in four minutes to a depth of 20 feet. October 23. The severe weather prevented us leaving the column to go to examine the plains back of these hills, but as the buffalo keep in them, only crossing the bottom to get to the river, we conclude there is a soil there that will produce what will sustain animal life.